A relic of St. John Vianney is coming to Philadelphia this weekend, Feb. 2-3. Opportunities for prayer and veneration will be available at the Cathedral Basilica of SS. Peter and Paul beginning Saturday at 2 p.m. until the conclusion of the 6:30 p.m. Mass Sunday evening. 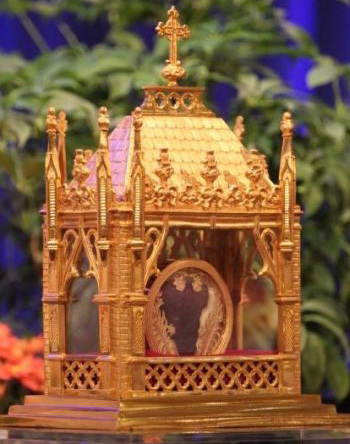 The Knights of Columbus have sponsored a tour of the relic of St. John Vianney’s incorrupt heart, encased in a glass and gold reliquary, across the United States since last fall through June of this year. St. John, also known as the cure d’Ars, was a 19th century French parish priest known for his generosity administering the sacrament of penance in his parish town of Ars, often hearing confessions for 12 hours a day. He died in 1859 and was canonized in 1925. He is the patron saint of parish priests. The tour of the relic is titled “Heart of a Priest,” alluding to the saintly model of St. John for today’s priests and to the relic of his heart that appears to have resisted natural decay for 160 years. In Catholic tradition relics are venerated as objects recognizing how God’s grace has effected holiness in a person. Neither the saint nor the relic are to be worshiped, which is reserved for God alone. A major or first-class relic such as a bone fragment or other part of a saint’s body is regarded by the faithful as a sign of the saint’s holiness and God’s action in his or her life. The relic of St. John Vianney will arrive in Philadelphia first for a two-day program of prayer and study at St. Charles Borromeo Seminary — the locus of priestly formation in the archdiocese for 187 years. At noon on Feb. 1, the relic will arrive from the Cathedral of the Blessed Sacrament in the Altoona-Johnstown Diocese. Seminarians and priests will pray the Divine Office, hear a conference by a theologian and pray in a holy hour. On Saturday, confessions will be heard, seminary rector Bishop Timothy Senior will celebrate Mass for the seminary community and another conference will take place before Knights of Columbus transport the relic to the cathedral in Philadelphia. Saturday, Feb. 2: 2 p.m. reception of the relic with public veneration until 5 p.m.; 4:15 p.m. sacrament of reconciliation; 5:15 p.m. Saturday evening vigil Mass for Sunday; public veneration until 7 p.m.
Sunday, Feb. 3: Masses are at 8, 9:30 and 11 a.m., with the sacrament of reconciliation at 9 a.m., the sacrament of baptism celebrated at 12:15 p.m. and a Mass in Spanish at 12:30. The sacrament of penance again will celebrated at 5:30 followed by Mass at 6:30. The cathedral is located at 18th Street and Benjamin Franklin Parkway in Philadelphia. St. John Vianney – Pray for us.